McLaren technical boss Paddy Lowe says Lewis Hamilton's decision to reveal confidential team information on Twitter has not done "much damage". 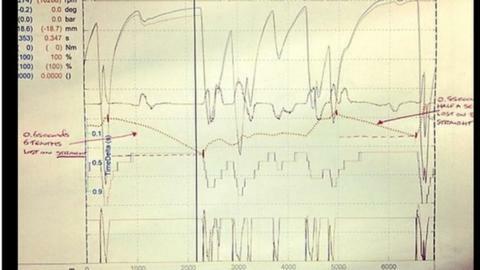 On Sunday, Hamilton posted a picture of data from his and team-mate Jenson Button's qualifying laps. Engineers from rival teams expressed amusement and disbelief at his decision to reveal valuable information. But Lowe said: "The data in there isn't any great use to anyone, so I don't think there is much damage done." The picture, which was removed after a few minutes, showed a telemetry sheet that had an "overlay" of the two drivers' qualifying laps. It showed their speed traces around the lap and also contained information teams guard closely, such as ride heights and braking and acceleration rates. An engineer from a rival team said that they could effectively work out how McLaren were running their car from the information. Lowe admitted that "several engineers" had approached him following Hamilton's tweet. "The information on there is available via normal routes anyway," he said. "Most teams will have a way of finding out the information in there. "But the actual mistake that Lewis made, he understands. He didn't really appreciate the nature of that information and that engineers don't like to see that because we spend our lives trying to keep things like that secret." The tweet of the technical information was the latest in a series of entries by Hamilton on the social networking site Twitter over the Belgian Grand Prix weekend that raised eyebrows in Formula 1. Throughout the weekend, he posted a series of tweets using colloquial language and acronyms that represented swear words, all of which were subsequently taken down. McLaren said they had asked Hamilton to take down the tweet with the telemetry sheet in it, but denied he had removed others at their request. Asked on Saturday why he had removed the other tweets, Hamilton said he wanted to "rephrase some of the things I said". McLaren team principal Martin Whitmarsh told BBC Sport that Hamilton had removed the picture of the telemetry tweet immediately. "He misjudged the situation," said Whitmarsh. "All the other ones, we didn't ask him to remove, but that one he removed and apologised. He wasn't thinking clearly obviously." Asked whether that was the end of the matter, Whitmarsh said: "Yes."